The time has come for true innovation in motion with the new, patent-pending Helix PD Pedal Drive. Featuring a 6:1 gear ratio precision-tuned to a 14 x 17 two-bladed fixed pitch prop, the Helix PD is the most efficient and intuitive pedal system ever engineered. Fully deployed, the system is optimized for maximum speed in exchange for less effort so you can be hands-free to fish all day. A groundbreaking auto-raising mast achieves zero draft with a spring-loaded kick pedal, and the unit can be further stowed forward and out of the way to complete the 3-phases of possible positioning. Tuned to the proven performance of Wilderness Systems’ S.M.A.R.T. Hull designs, and currently compatible with the new Radar model family, the Helix PD Pedal Drive is the definitive advantage. 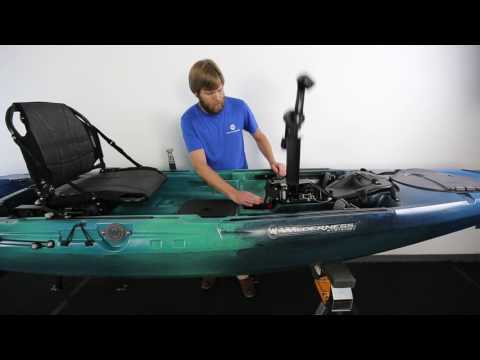 Introducing the Radar 115 – Wilderness Systems first tri-powered kayak with paddle, power and pedal capabilities.